I promised in my last post that I would tell you more about "The Pioneer Woman" likin' sushi, and it's taken me a week to get to that. Anyway, I learned about The Pioneer Woman from my gal pal Monica, during a laughter-filled girls' night out having sushi on St. Patrick's Day. Monica has become a big fan of The Pioneer Woman, and after checking out her site, I'm an ardent new fan, too. In a nutshell, The Pioneer Woman is the moniker of an articulate, funny, charming woman named Ree Drummond who blogs about her life as a former city gal who fell in love with a sweet cowboy and rode off in the sunset with him. Her web site is chock full of her well-written musings and her gorgeous photos, focused on her hobbies and experiences - primarily cooking, photography and raising four kids (!) and various ranch animals. 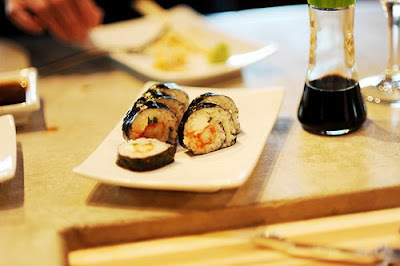 I'll tell you later in this post what really hooked me on The Pioneer Woman, but for RawFishy purposes, I'll tell you now that Ree's "Cooking" section includes several good posts on SUSHI - including this very informative post, complete with photos and video, about sushi rice. See, The Pioneer Woman in her former life embraced and gorged on the Los Angeles lifestyle while living here as a USC student. She was the ultimate consumer of our multi-culti offerings here. So while she loves her life on the range, she does miss sushi. So, get this: her adorable cowboy husband got her a sushi chef for her birthday!! So yeah, I've been drooling over The Pioneer Woman site, not so much because of her sushi postings, but because of the stories she tells about her adorable cowboy husband, known as "Marlboro Man" throughout the site. In fact, what really hooks us women folk is Ree's recounting of her love story - how she met and married Marlboro Man - in serial novella style. Written with great humor and whimsy, her "Black Heels to Tractor Wheels" is an online romance novel in 40+ chapters, written in posts over the past couple of years, started in honor of their 10th wedding anniversary. But it's not the heavy panting, bodice-ripping, tall-dark-and-handsome type of romance novel (which I DON'T read); it's a truly sweet, charming story that seriously turns even those of us with feminist convictions into mush - and literally has kept me at the computer for hours to read through all the installments.